“Exhilarating and the views of the beach and sea were spectacular.”I just wanted to thank you for the parasailing trips that you did for me and my sister on Jan 12. For me it was one of many highlights of my three-week trip to Costa Rica. It was exhilarating and the views of the beach and sea were spectacular. I felt very safe too. “We felt that you were very trustworthy and we were in safe hands.”Hi. We met you in Manuel Antonio on the beach and did parasailing, fishing and went on your banana boat. We felt that you were very trustworthy and we were in safe hands. We’re all wearing and loving our t-shirts and hope to come back to Costa Rica again some day as we had a terrific time- thanks partly to you! “The kids voted you their favorite people they met during the trip…”Hi there, just wanted to drop you guys a line and say thank-you so much for one of our best experiences in Costa Rica. It was definitely worth fighting our way through Quepos and Manual Antonio to find you! The kids voted you their favorite people they met during the trip, and we met a lot of people! 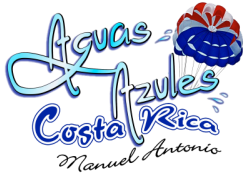 We left your brochure with our hosts at Pacific Edge, and if we have any friends coming your way we will definitely recommend Aguas Azules! “Those roosters sure can fight.”I wanted to thank you again for the great fishing trip. Those roosters sure can fight. Hopefully I’ll be back again next year, and will do a full day trip, and some parasailing as well. “Many thanks for all the fun I had with you and your crew.”Many thanks for all the fun I had with you and your crew. Maybe next year we can head up to Jaco or down to Dominical! My very best to you all and look forward to hearing from you and, seeing you next year, Keep on chuting. “I still really appreciate how gentle you were with the kids…”You guys are great – Miguel, I still really appreciate how gentle you were with the kids when they weren’t feeling well. I really hope the parasailing business takes off (no pun intended), and we hope to see you soon! “You all just couldn’t have been better to us…”Thanks to you and your guides for making this such a memorable experience for Hannah and me. I may forget it eventually, because of my age, but she never will–isn’t that great? Thanks again. And if you two are ever in Raleigh, NC, you have a place to stay. If I can just get some people to use your tours, that will be satisfying for me. You all just couldn’t have been better to us, and it wasn’t CoCo (though he was terrific in getting me super pictures of the dolphins), but the other guide who went snorkeling with Hannah who helped her make a final decision to follow her dreams and to pursue education in marine biology. Isn’t it strange how one can affect someone else’s life and never even know it? She and I both thank you. “Fantastic Experience”We could not have been happier with Melanie, Miguel and their crew. They made us feel so at ease and it was very obvious they were very experienced and very professional. Their crew was like a well oiled machine. You can’t get a better view of Manuel Antonio than parasailing with the best. Worth every cent!. I would recommend them for a great time on the beach at Manuel Antonio. Can’t wait to go back and have another adventure with them. “Safety conscious – awesome company!”One of the highlights of our trip to Manuel Antonio was parasailing off the beach with the help of Aguas Azules. Melanie and her husband Miguel made me totally comfortable with sending off my four children (including a 5 year old) high into the sky! They had new equipment, a full staff and were more than conscious about all safety concerns. Melanie is American so we also picked her brain about everything Costa Rican! For an awesome view of the area and a great overall experience, definitely add this to your itinerary! “Great Experience- Do not Miss this!”When in Costa Rica at Manuel Antonio, don’t miss the chance to parasail with these folks. They went out of their way to make sure that we had a good experience, took pictures that they sent us and were reassuring to two old folks trying something new. Great to do this with an English speaker as well. Try it at sunset!